In the wake of last year’s overwhelming global support, Helen Woodward Animal Center is uniting with animal-lovers and animal welfare organizations worldwide for the 2nd Annual Remember Me Thursday global pet adoption awareness campaign. Now some very big names are stepping forward to lend their support to the cause, including Emmy Award winner and Golden Globe nominated actress, Katherine Heigl, who has been named official spokesperson for the 2014 campaign. Around the world, candles will be lit on the exact same day, honoring the millions of pets who lost their lives over the past year without the benefit of a loving home. Helen Woodward Animal Center encourages the community to take part at scheduled candle-lighting ceremonies or online Thursday, September 25th, 2014 and bring attention to adoptable pets still waiting for forever families. The first Remember Me Thursday took place on the fourth Thursday in September, 2013. Moved by the staggering statistics of homeless pets who lose their lives each year (The Humane Society of the United States approximates this number at 3.4 million annually in the US. ), Helen Woodward Animal Center President Mike Arms put out a call to rescue organizations in an attempt to create a global awareness campaign. As creator of both the International Pet Adoptathon and the International Home 4 the Holidays program which, in partnership with national animal organizations, has placed 9.3 million pets in homes since 1999, Arms was able to send out an expansive request and the response was significant. 139 countries united to support the movement including Germany, Mexico, Canada, Spain, the Philippines, Japan, Puerto Rico, Australia, the United Kingdom, and many more, with over 100,000 individuals holding candle-lighting ceremonies of their own, spreading the message through social media, visiting the Remember Me Thursday website or lighting a virtual candle. Now in its second year, the Remember Me Thursday campaign continues to expand with multiple candle-lighting ceremonies and special events already organized internationally, as well as an A-list lineup of celebrity supporters. As official spokesperson, Katherine Heigl adds another charitable title to her growing list of animal-focused endeavors. The award winning actress, best known for her starring roles in such films as 27 Dresses and Knocked Up, and her portrayal of Dr. Isobel ‘Izzie’ Stevens in the television medical drama Grey’s Anatomy, is co-founder of the Jason Debus Heigl Foundation, an organization dedicated to animal welfare. A dedicated mother of two girls, and loving guardian to a menagerie of pets, Heigl is also set to star in the NBC drama series State of Affairs this Fall. She is taking time out of her busy schedule to champion homeless pets and is featured with Oscar, one of her adopted dogs, in a downloadable poster for participating animal organizations. Heigl is not the only celebrity supporter. Accomplished Emmy and Tony-award winning actress and singer Kristin Chenoweth is lending her voice once again by offering her inspiring song “It Will Be Me” as the official anthem of the Remember Me Thursday campaign video. 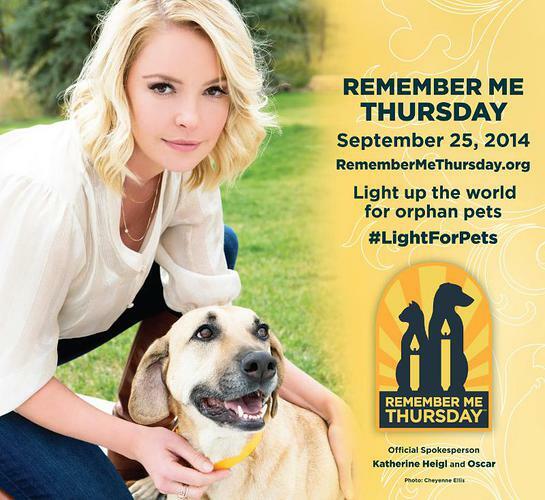 Other actors, comedians, pet behaviorists and professional athletes are showing their love for orphan pets by taking the title of campaign “Luminaries,” reminding the public to light a candle Thursday, September 25th, 2014. Tamar Geller – famed canine coach and author of The Loved Dog: The Playful, Non-Aggressive Way to Teach Your Dog Good Behavior (Gallery Books, 2008) and 30 Days to a Well-Mannered Dog (Simon and Schuster, 2011) and founder of nonprofit Operation Heroes & Hounds pairing shelter dogs with injured military. Remember Me Thursday asks organizations and individuals to dedicate the fourth Thursday of September, annually, to remembering the millions of homeless pets who lost their lives over the last year. By uniting in this way, the worldwide awareness campaign hopes to shine a light on the millions of healthy and loving orphan pets still awaiting adoption. Individuals can get involved by attending a candle-lighting ceremony at their local shelter, or assisting with organizing one; lighting a virtual candle on-line at www.remembermethursday.org; changing their social media profile pictures to the Remember Me Thursday icon all day, September 25th; spreading the word about Remember Me Thursday on Facebook, Twitter, Instagram and other social media channels using #LIGHTFORPETS; and most importantly by always adopting and encouraging friends and family to do the same. 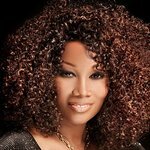 For more information on Remember Me Thursday and a full list of participating celebrities and animal welfare organizations, go to www.remembermethursday.org.